I’m new to this blogging thing, but my wife blogs extensively about her quilting/patchwork and really enjoys the process and feedback she gets, so here goes. I’ve restarted modeling after a 25 year (i guess) break and I am amazed at the developments that have been made in production, tools, acrylic paints, “add-ons” etc that are now available. 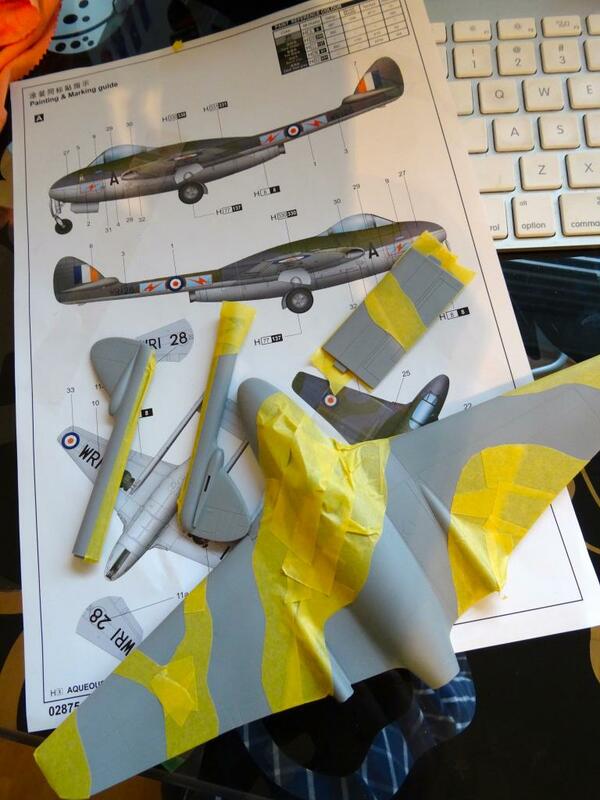 It all started with an Airfix 1:72 Spitfire for a bit of fun and I’m now hooked! 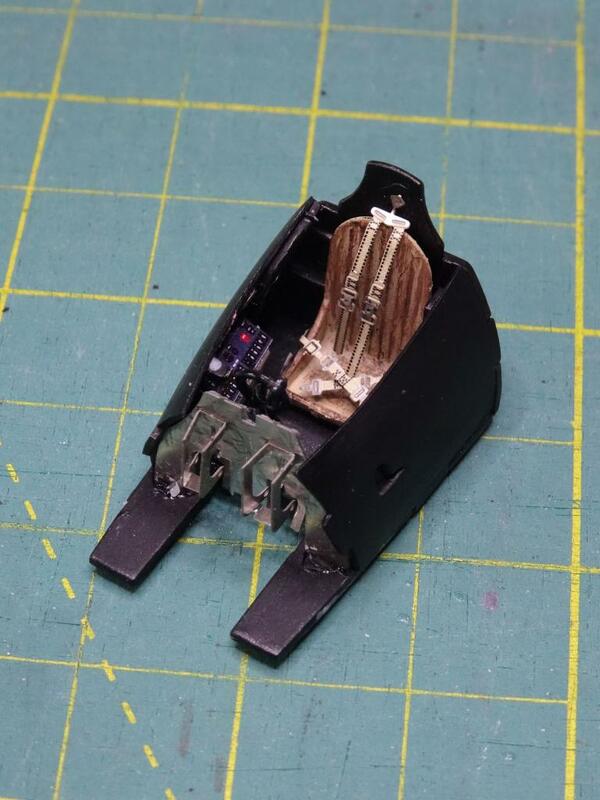 So this kit is a 1:48 DH Vampire FP.Mk9 by Trumpeter (I’ve settled on 1:48 mainly as i find it easiest to work with). 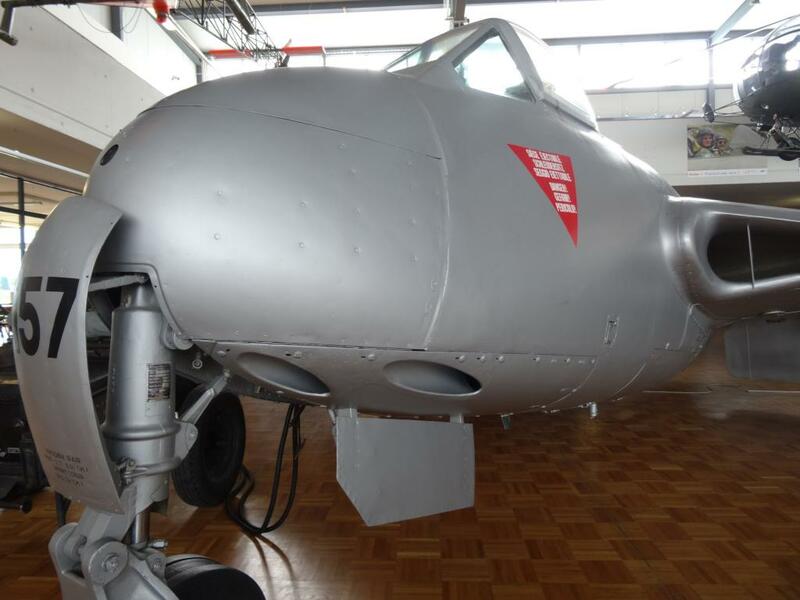 It is a fascinating aircraft, this Mk used mainly in the Korean war so will have mixed sliver and green/grey camouflage paint scheme. I took a trip to the local museum to get some inspiration as they have two Vampires and a Venom that you get get right up close to. The interesting thing in construction is it was a mix of wood and stretched metal (I found myself tapping the aircraft to see where the wooden cockpit section ends). I was also interested in see the ‘silver metal’ finish up close – when I sprayed the lower half (using Tamiya X11) I found the finish quite ‘grainy’ but after searching the web saw i was not alone but a quick go over with a 1500 grade sanding sponge toned it down somewhat. I do have an Eduard EE Lighting in my stash which will be all over metal so I want to get things tested before I start on this. I’m now up to painting the camo scheme, and I actually enjoy the process of masking. I’ve learned that the time now goes into preparation (masking, cutting) and cleaning (the airbrush) more than anything but it is time well spent for the result you get vs. the simple brush. So I’m guessing this will take another two weeks to build (work life permitting) but I intend to post pictures of the finished model (whatever the outcome). Welcome aboard sir, all looks good so far. Looking forward to seeing it when finished. Looks like Trumpeter came out with a nice Vampire. I tried the old HobbyCraft kit years ago and was not satisfied! I’ll have to look for it. It looks like the cockpit builds up nice with just enough detail to look full through the cockpit opening! (With a little help from Eduard!) Next time you try an aluminum lacquer plane, try Testors metallic silver in the spray can. The metallics are very fine in it and it isn’t glossy or dull, just silver! (Best way I can describe it!) Looks totally like aluminum lacquer paint! Can’t wait to see the completed build. These are cool little airplanes! One thing with the seatbelts, easy to fix once you re-open the cockpit: push the belts down so they lie in the seat. They’re not stiff like that with the real thing. Other than that, you’re going well. Looks like your well on your way to “recovery”, Richard…seems to be more than just few that are finding the hobby once again and you’re off to a good start there. And I’m sure “everything” will be satisfactory when you ARE done with this great little build. Welcom to iModeler, Richard, and thanks for the interesting first post. Looking forward to see more from you soon. Many thanks for the encouragement and tips. Will repost when i’m finished! 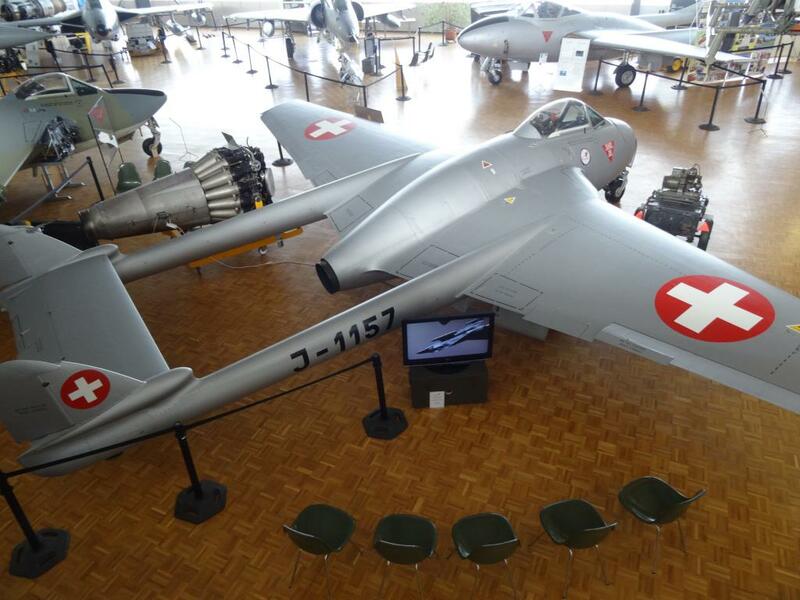 Thanks for the museum pics too – what museum is that? 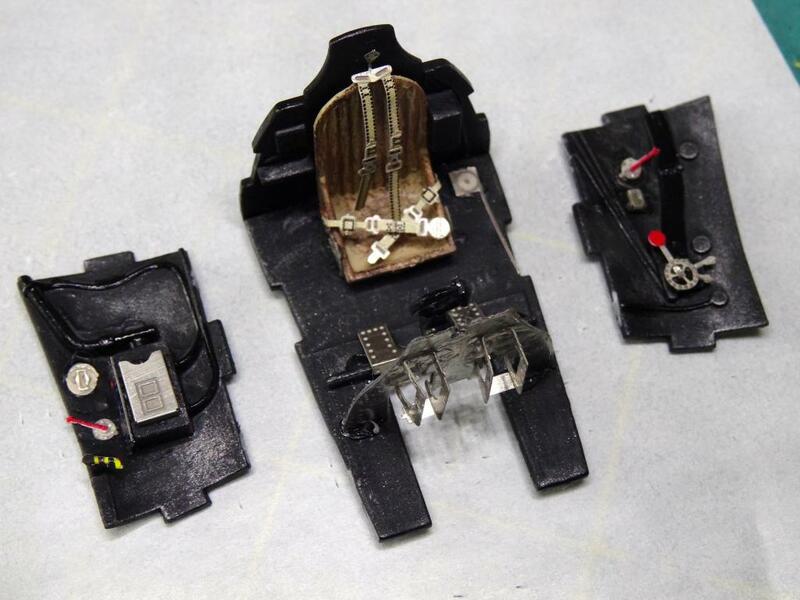 PE is ‘photo-etched’ – metal parts (pre-painted in this case) which can reproduce more detailed items than you are able to get from normal plastic moulding. 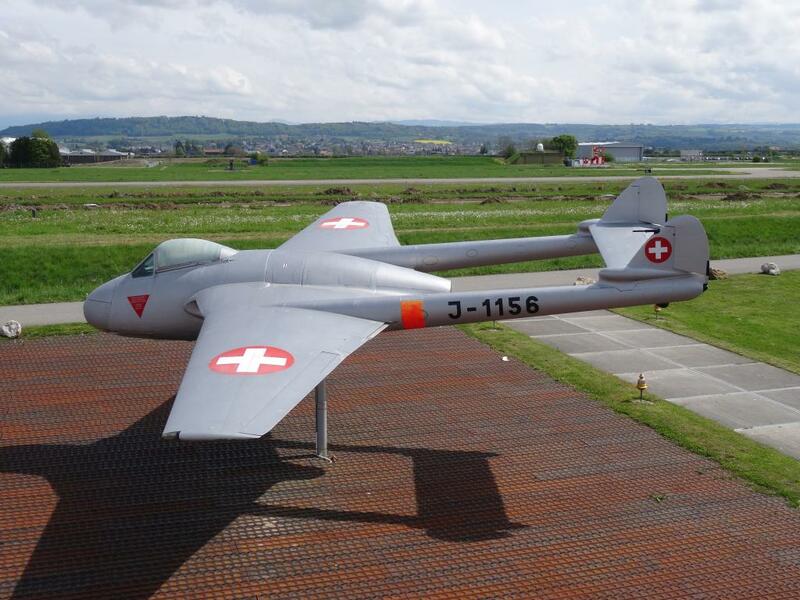 The museum is Clin d’Ailes in Payerne, Switzerland – home to a few ex-Swiss air force aircraft, including De Havillands built under licence in Switzerland. 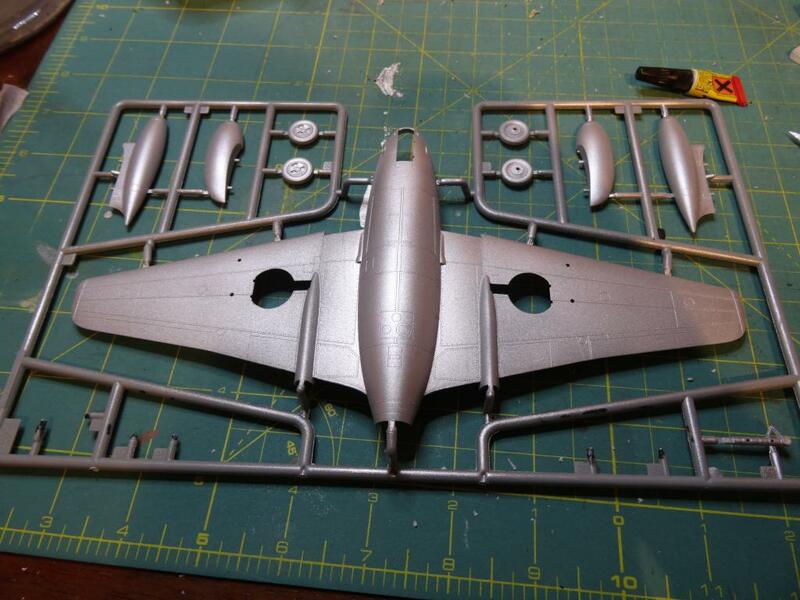 Can’t wait to see the finished model, the Vampire is a great looking aircraft. Welcome to iModeler Richard. Beautiful work on the cockpit. I built the Trumpeter Vampire FB Mk5, same kit different decals. It will take a lot of weight to keep it from being a tail sitter. Look forward to seeing yours completed.